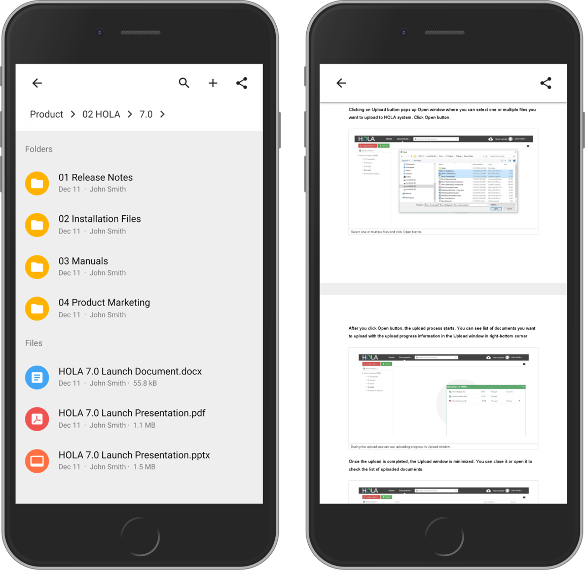 HOLA Lite enables you to access all your documents on the go. It is a mobile web app through which you can connect to your HOLA system. This means you can access your documents and work with them from anywhere using your mobile phone or tablet. With HOLA Lite you can easily access all your documents, folders and cabinets in your phone while you are on the go. HOLA standard security model is applied to your access, so you will only be able to see documents and folders you have access to. Same applies to actions. You will be only able to perform actions based on your HOLA security setup. Learn more about HOLA's security features. HOLA Lite can run on both Android and iOS mobile operating systems and the app automatically adjusts to the screen size, so you can use it with mobile phone or tablet of any size. The only requirement is to have a modern browser (or WeChat) installed on your device. 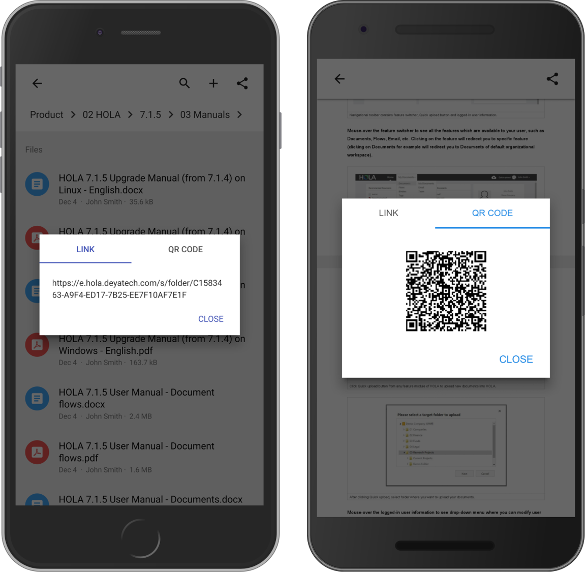 With HOLA Lite, it is very easy to upload new documents/files from your mobile device into HOLA system. All you need to do is go to a folder where you want to upload new file, click Add button and select Add file option. On Android system, this will pop up window from where you can select app (File Storage, Gallery, Camera, etc.) from which you want to upload new document1. 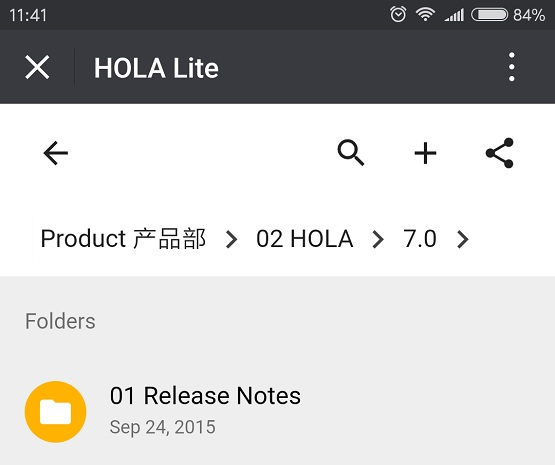 After you select the app, and from within the app specific document you want to upload, HOLA Lite will upload the file into HOLA server. On iOS system, it is not possible to access phone's file system or files from 3rd party apps. Therefore when you click Add file, the iOS will automatically open Camera app. You can take a picture and once the picture is taken and confirmed, HOLA Lite app will upload the file into HOLA. You can also easily create new folders using HOLA Lite. Go to folder where you want to create new folder, click Add button and select Add folder option. Inside HOLA Lite you can easily share any document, folder or cabinet. Sharing can happen via share link. You can copy the link and paste it to other apps on your phone, such as WeChat or Mail app. If you want to share a document with somebody who is next to you, you can share QR code with such person. All they need to do is to open QR code reader (inside WeChat or using another QR code reader app) and scan the QR code. Obviously, HOLA security model makes sure that only users with proper security privilages will be able to access shared documents, folders and cabinets. 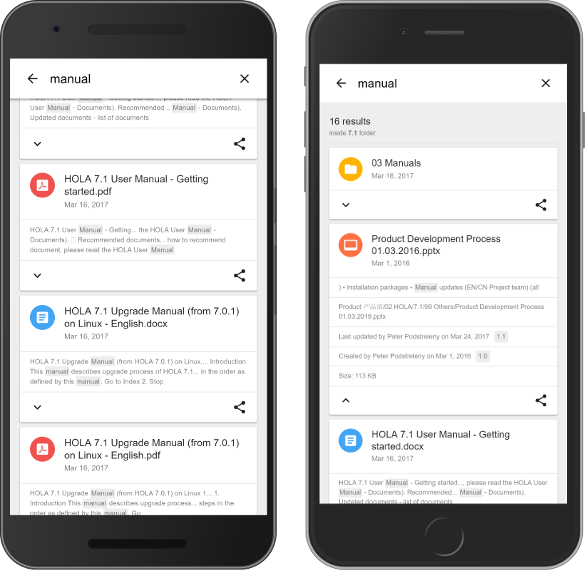 HOLA Lite enables you to quickly search for and find documents you want to read or work with. You can search inside whole workspace, search inside specific cabinet or search inside specific folder. HOLA Lite will automatically reduce search scope based on location from where you are searching. Search results provide information about the search scope, number of items found and each item is presented in a card format. Search result card can be expanded to provide additional information about each item like document size, location or when the document was last modified. Again, HOLA security model applies to search results, so documents, folders and cabinets for which you don't have access will not show up in search results. As HOLA Lite is a web app, all its features can be accessed within built-in WeChat webview. You can add HOLA Lite link to your official company WeChat account and all your employees can access HOLA Lite from within WeChat. When you open this link, WeChat's internal webview opens up and you can use HOLA Lite as usual. Also when you receive share link in WeChat message, just click on it. It will open the WeChat's webview where you will be able to access shared document, folder or cabinet. 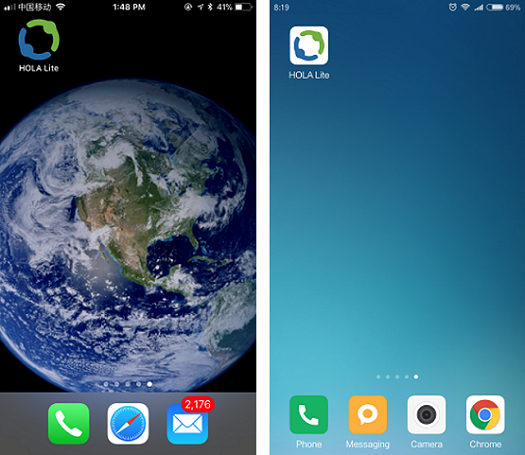 When using HOLA Lite inside WeChat, the HOLA security model is applied to the access and actions related to documents, folders and cabinets. Click here to learn more about HOLA security features. Even though HOLA Lite is a web app, you can still add app launcher icon on the home screen of your phone/tablet. When you tap the icon HOLA Lite will be automatically launched. This feature requires HOLA Lite to be served via secure HTTPS connection and browser support for this feature may vary. We recommend using Google Chrome browser or browsers based on Chromium project1. For more details on how to setup Home screen launcher, please view this document. When there is a new version of HOLA Lite available, it will automatically download and update itself on your mobile device. This means you always have the latest and the best version of HOLA Lite on your phone or tablet. HOLA Lite is using modern web standards in order to provide compelling and fast native-like web experience. Due to this, HOLA Lite only works correctly in browsers that support those web standards. 1. Certain features such as Home screen launcher and Automatic updates require your HOLA Lite to be served via secure HTTPS connection. Also, level of browser support for Home screen launcher, Automatic updates and document uploads may vary. For the full, best and fastest experience we recommend using Google Chrome or browsers based on Chromium project.